Let us face it. 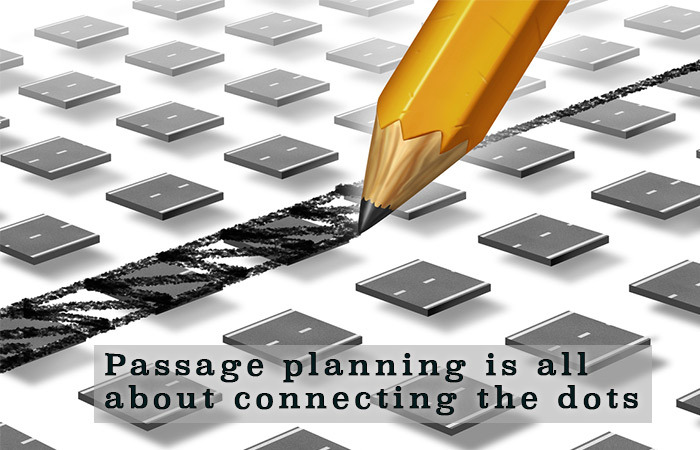 There is a huge difference between a passage plan and a good passage plan. The good passage plan is a work of art. You know it when you see a good passage plan. How can we define a good passage plan then ? A good passage plan is the one that has all the information on the chart and yet the chart is not cluttered. It is the passage plan which has all the information marked at locations where it is supposed to be. And it is the passage plan that gives the confidence to the watch keepers about the preparedness of the bridge team. But sometimes we either have too less information on the chart or so much that it hides the important information. Now how to place all the information on the chart and yet not clutter the chart ? It all starts with the knowledge of why something is required and what use it can be of. And when it comes to safely executing a passage plan, there are certain rules of thumb. One such rule of thumb is knowing when we can abort a passage plan. 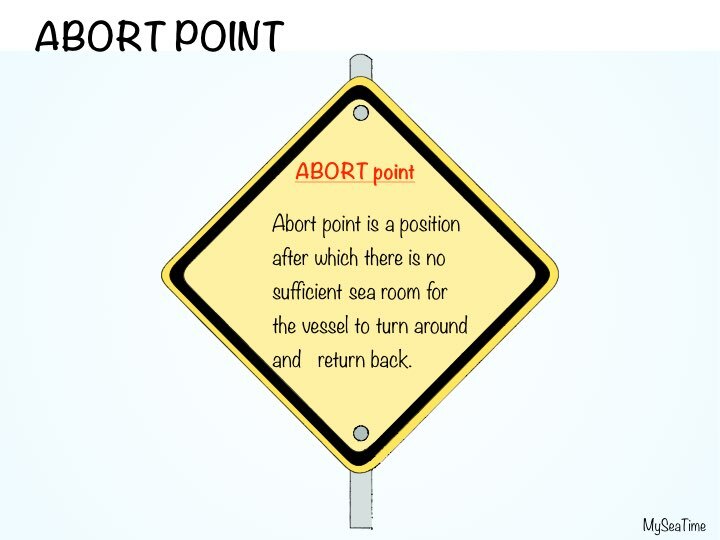 Marking of “Abort point” help in doing so. In this post we will discuss everything about abort point and also if “point of no return” is any different than that. Abort point is not limited to maritime field only. Even the air pilots have to consider abort point for take off and landing. For example, for them the abort point is the point after which the runway is too short to stop the airplane. After the abort point they have to pull the throttle and fly even if they sense a problem. They can anyway come back and land again if they feel so, but they cannot stop the plane after abort point. Air pilots calculate the abort point based upon the speed of the airplane, stopping distance at that speed and the available runway length. 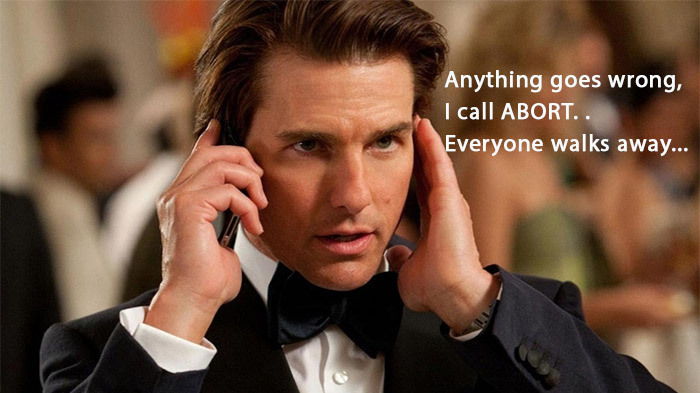 For Ethan hunt, abort point is the maximum time at which if he doesn’t call the mission off, it can get his team members killed. On the ship it is no different than that. For a ship the abort point is the point after which there is insufficient sea room to turn back. While entering a port if we try to swing back after we have passed the abort point, we may end up grounding the vessel. Or we may end up hitting a danger mark. So In simple word, abort point is the point after which there is no sea room to turn the vessel and return back. Where to mark abort point ? 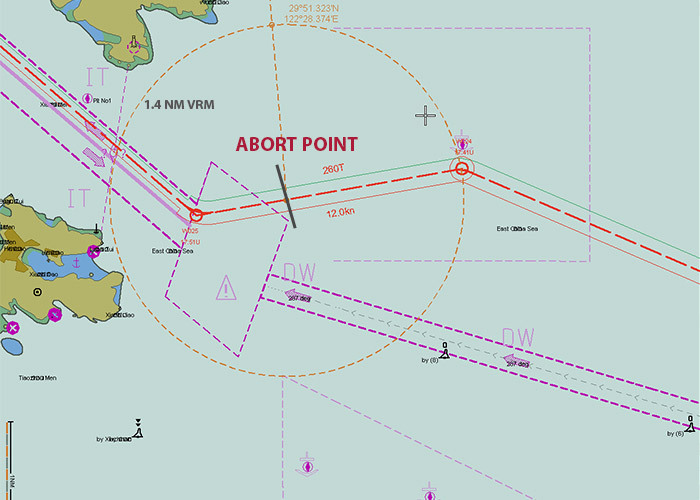 We need to mark abort point only when approaching a port, canal or such restricted areas. We do not need to mark abort points in open sea just because of one patch where vessel cannot turn. This is because even when there is no room to swing the vessel, we can still continue with our passage to turn after passing that patch. 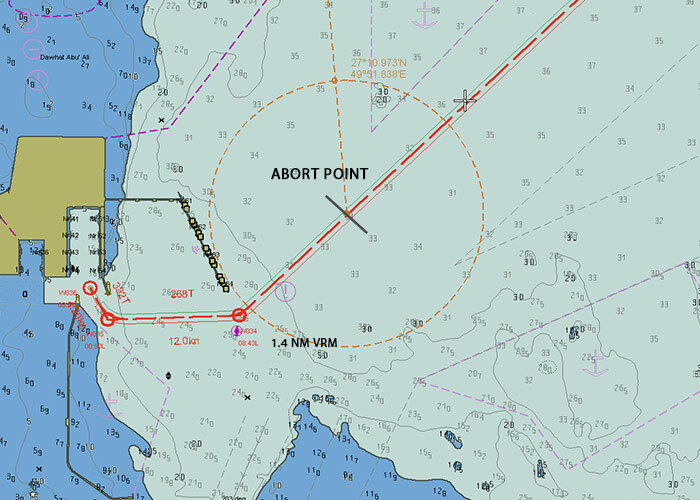 For example while passing Singapore straight, we do not need to mark abort point anywhere. If we need to turn back, we have all the time to assess the situation while we continue towards the general traffic flow in the TSS. How to mark abort point ? To safely swing the vessel and return back, there are two things we need to know. If I put the rudder hard over, how much distance the vessel will cover in forward direction and second how much distance it will cover on the side of the turn. This area should be clear for the vessel to turn around safely. 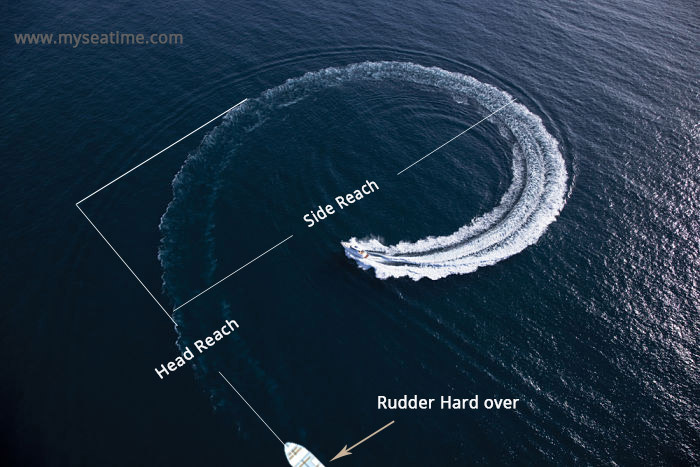 So we need to know the maximum “Head reach” and maximum “side reach” of the vessel in a full turn. Though not exactly but the forward distance covered is close to the “advance” of the vessel and sideways distance is close to “tactical diameter“. 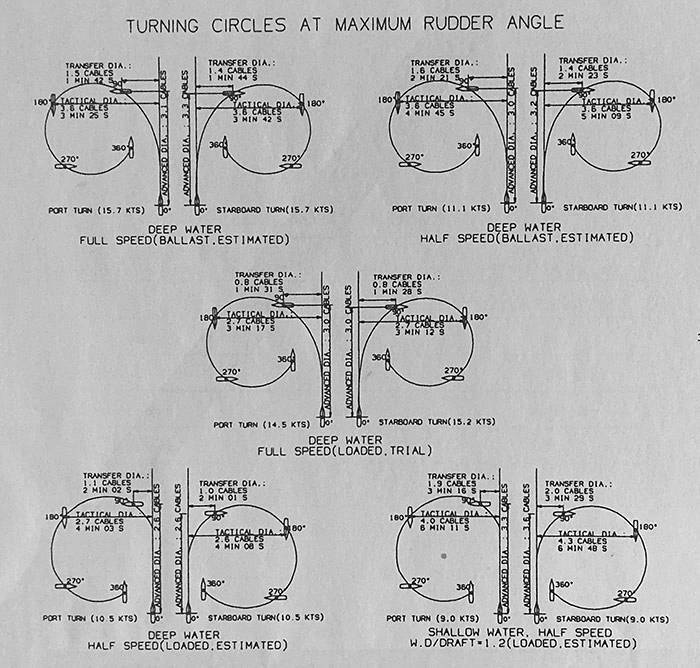 You can find the highest value of advance and tactical diameter from the manoeuvring booklet. For example below is what I found from a 45000 DWT ship’s manoeuvring booklet. You can also get this data from wheel house poster on the wheelhouse. Find the maximum tactical diameter and advance of the vessel. As the abort point will most likely be marked in lesser depths, use the data for shallow water. Below is the turning circles data from same vessel of 45000 DWT and you can see the max tactical diameter is 0.45 NM in shallow waters. Take the value of tactical diameter or advance whichever is greater. Here we have maximum value as 0.45 NM. Just double this value to allow for external factors like current and wind which can affect the head reach and side reach. Take the additional distance that the ship would cover in 5 minutes. These 5 minutes are to allow for analysing the traffic around before we start to turn the ship. So say we have planned a speed of 6 knots while approaching a port. In 5 minutes, ship would cover around 0.5 NM. 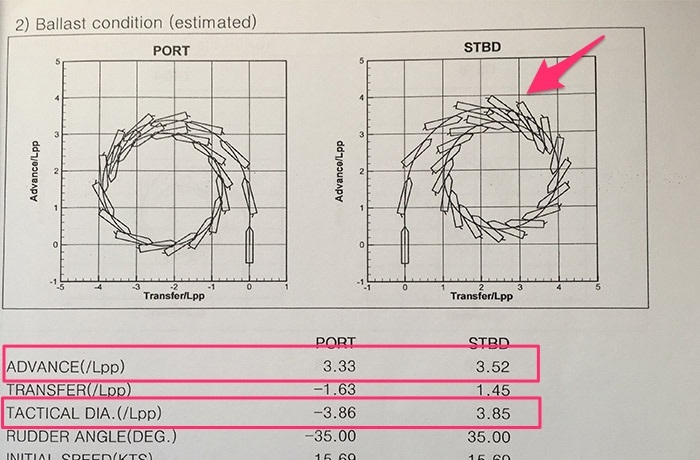 So it all adds up to be 1.4 NM distance for marking the abort point. Now mark the abort point at such a position close to the entrance of the port that has 1.4 NM clear distance in the forward as well as on the sides. Like below is the abort point marked for arrival in one of the chinese port. So are we saying that after passing abort point vessel cannot turn ? of course we can. There are number of ways. We can use succession of ahead and astern movement to turn the vessel without any significant side reach. Or we can use the bow thruster if we have and if our speed is below 5 knots. Using astern movement and bow thruster can even turn the vessel virtually at its position. Another question. Are we sure that just before abort point we can turn the vessel ? There could be lots of ships on both sides of our vessel and we may not be able to achieve the turn. The idea of the abort point is to have an indication as to when vessel can or cannot turn back just by putting the rudder hard over. It is to be used as an information and not as a blind fact that vessel can surely turn or cannot turn. This is where experience of the navigator comes into play. Abort point is an important information that along with other informations helps the navigator take wise decisions. Now there are few mistakes that we make while marking abort point. These mistakes must be avoided to have a good passage plan. Mistake 1: The abort point is marked too close where there may not be sea room to swing. In this situation, ship cannot turn even before the abort point. Master may have wrong impression that he can swing the vessel as vessel has not crossed abort point. If he believes in the passage plan and try to swing, he may end up grounding the vessel. Another mistake we can make is marking the abort point too far. Even after crossing the abort point, ship would still have room to swing and return back. This information is of no use to the person in con as it is an inaccurate information. Do you wonder why this is called “abort point” and not “abort line”. Because it is a point on the planned passage and not a line. But sometimes we draw a line indicating position of abort point. Can you see some problem in this ? If the vessel’s position is off track, Can we safely turn the vessel if we have not crossed this line ? I am sure your answer is no. 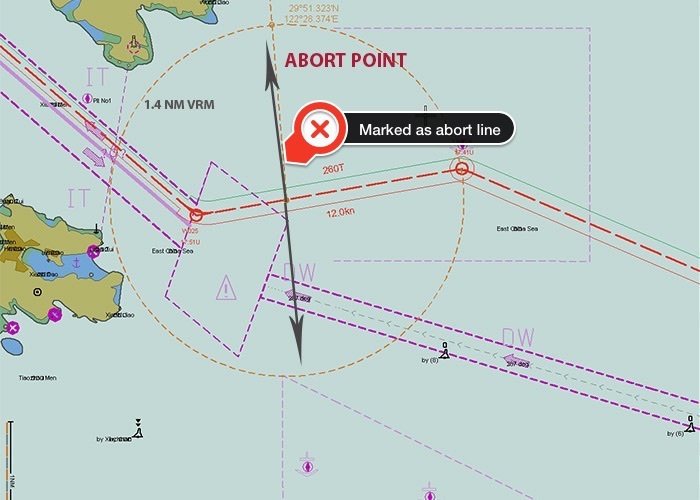 If we draw a line marking the abort point position, it can give the wrong impression when the vessel is off track. It will look like we are still behind the abort point and we can turn the vessel, while it will not be the case. Not atleast on turn to one side of the vessel. So we need to mark abort point the way a point should be marked. We can show this position by a very small dotted line or by pointing to that position by an arrow. Have a look at below abort point marking. The abort point is marked at the correct position. And nothing seems to be a problem in this, except one. The problem is that the abort point is before the pilot boarding position. Now why this would require special attention ? To pick up the pilot, we need to cross the abort point. What if after we cross abort point, port control inform us that the pilot is cancelled for today. We cannot turn around as we have already crossed abort point. If we ever need to cross the abort point to pick up pilot, we should be ready for situation as mentioned above and should have steps ready to counter that. Have the bow thruster ready if that is fitted on board. The whole idea is that you should assess the situation taking into account the fact that you may need to turn around after crossing the abort point. There is a whole lot of mystery around the term “point of no return”. Some say there is no difference between “Point of no return” and “abort point”. Others consider there is a difference but they fail to give a logical difference between these two terms. Let us see if “point of no return” is any different from the “abort point”. First let me acknowledge that Yes, these are two different terms and there is a slight difference between these two. After you cross abort point, you still can turn around. There are number of resources to help you with that. For example you can use astern movement, bow thruster or even tugs if you have those made fast. But after you cross “point of no return” you cannot return back even if you use all these resources. One good example for this is moving in a falling tide. You may have crossed a point after which if you wish to return, you cannot. Because the tide level has gone down and now there is insufficient waters behind you to proceed back. While coming from south of brazil and entering Amazon river, you will find one such bar of around 6 meters charted depth. Now consider this example. Your ship is going to Manaus, a port in Amazon river. 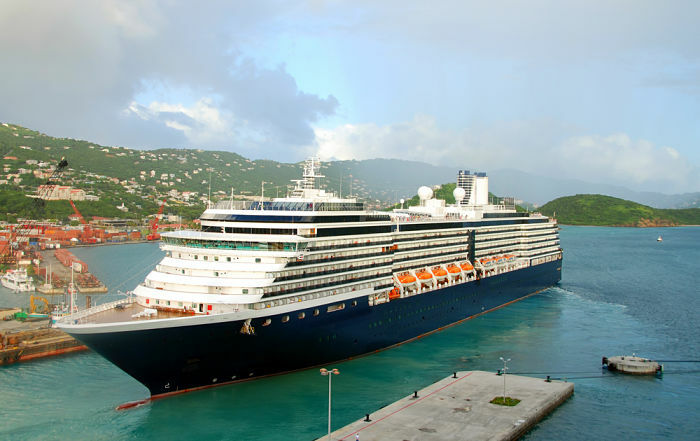 Let us say that your ship requires 10 meter depth to comply with UKC policy of your company after giving consideration to squat and other factors. Now in this area you got 4 metres of tide at 1000 Hrs today and then you have same tide height after 2 days. You cross this point at 1000 Hrs. At 1400 Hrs you are advised that you no more need to call Manaus. Can you abort your passage to Manaus ? Yes, you can. There is no issue with the vessel turning back as after we have crossed this bar, there is sufficient sea room to turn around. After turning back you can find an appropriate location to anchor. In any case you have aborted the passage. Now can you return back ? No, you cannot. There is no depth of water to return back. You have to wait for the tide level. So “point of no return” is the better abbreviation for this situation. There are number of elements in a passage plan. All these elements need to be marked on the charts for the passage plan to be called complete. But if these are marked at the wrong places, they can confuse the navigators leave alone helping them. Marking these elements at the right places require thorough knowledge of all these elements. Abort point is one such important element of the passage plan. We need to mark it at a place that can help the navigators. Marking these at incorrect positions can be more dangerous than not marking at all. Dear Sir First of all many thanks for such beautiful article. I learn lot from them. I would definitely love to sail with you in near future. Yes sure Sanjay. Hope to have you on one of the ship. Simply explained Nice article sir. In future please add more item required for good passage planning. Glad you liked it Sagar. I will be writing on parallel indexing techniques very soon. Glad you liked it Krishnan.. Yes I will write on all these topics.. Thank you so much for spending your time on writing this article sir! It's really helpful specially for Junior officers. Looking forward to many more articles. If you could please do write an article regarding anchoring procedures, swinging circle and how to calculate how many shackles to let go with regards to the charted depth. Thank you very much in advance sir! Please share your email address so that juniors like me could seek advice from you. I had written an article on Anchoring procedures which you may find useful. 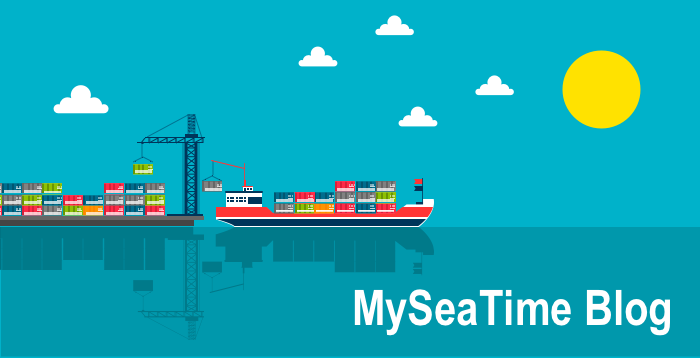 http://www.myseatime.com/blog/detail/the-ultimate-actionable-guide-of-anchoring-a-ship . If it is only one point and after that you have sufficient room taking into account the traffic density, no need to mark abort point. There are not many example of point of no return and probably that is the reason we hear more of abort point than point of no return. Glad you found it useful Bharath..
Hi! Very well written article. Saddened to see that the present generation at sea has to know so much of this theoretical stuff. Most of this is not even relevant to be used on ship. It is purely for academic purpose. How many of us have actually used the abort point on board? Anyways this is a subjective opinion. Company has to give guidelines on this in their BMM which will be full and final! Hi thanks for your comment Sir..As you said this is subjective opinion and I really appreciate that. From the comment you seem to be a seasoned sailor and I thought May be I can really learn a thing or two from you in future but could not find your email : ). Hope to have your opinion on other future articles too. Dear sir thank you very much for this article . very nicely explained . Glad you liked it Aninda..
Dear sir, do you write any artical regarding deck log book need conent or sample. I haven't written anything on deck log books but I will include that in my list for future posts. 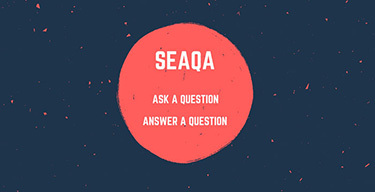 If you have any particular question, don't hesitate to post it on SEAQA section..
Good article. May I suggest addition of contingency anchorage and route to contingency anchorage in addition to abort point. Thanks Pawan.. I will include in some of the next articles..
Dear Capt Rajeev Jassal. Wonderful article. Wonderful article! 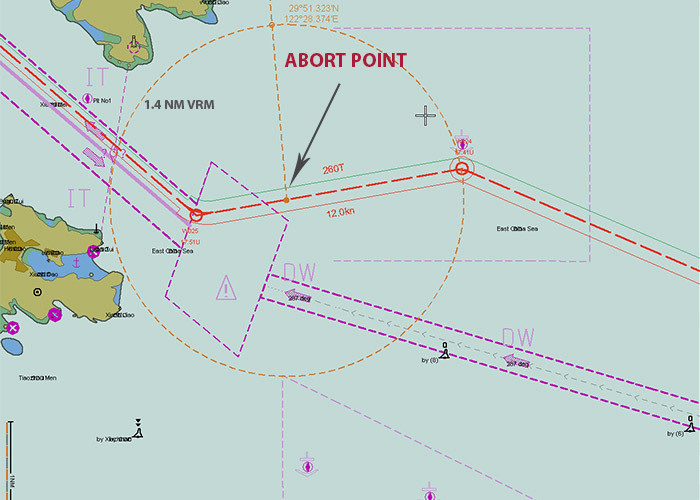 I'm just confuse if you still need an abort point marked on your chart/electronic chart if you have sufficient sea room, example on single point mooring. Do you still need to mark it on your chart? If there is sufficient room, there is no need to mark the Abort point. Thanks for this clarification. Most of the time we are loading/discharging on SPM and somehow some inspectors are still looking for this abort point. Again, thanks! Very well written Capt.Rajeev. I am curious if a route to contingency anchorage need be plotted from the abort point from a SIRE point of view. I do understand that it might not be possible to lay it in advance bss traffic, lack of suitable anchoring depth/ ground. Your thoughts..
No, there is no need to plot the route to contingency anchorage from the abort point. Capt. you couldn't have explained it any better. Sometimes as navigators we just put in information on charts to simply comply with company procedures and vetting inspection. However, a good passage plan will at one glance give the bridge team a good and comprehensive understanding of the sea passage and confidence in executing the passage plan. Thanks for the article in clarifying the two terms that although are slightly similar are quite different. dear capt. sir, i am very much thank full to u that u have provided us such a good place of knowledge .no words. Many thanks for the article. Clears a lot of queries. However, I do have a bit to add to examples of 'point of no return'. Please do correct me if I'm wrong. A ship which is about to enter a canal can be considered at point of no return when it is at enters the canal. Also, a ship which is entering a fairway or channel with shallow depths around is also at point of no return at the entrance of such channel especially if the channel follows a convoy system or has regulatory traffic directions for the channel. Very well written & your blog are always a pleasure to read, giving good practical insights for mariners . With regards to point of no return , I do agree with your take, which is also point of no return but I have a slightly different interpretation as well , Abort point and point of no return should always be used in conjunction , abort point is a point where decision is made to abort the passage and point of no return is a point after abort point beyond which V/L can't proceed with available resources on board. , basically abort point is the amber light and PONR is the red light in the plan eg. edge of 1.4 nm circle in your blog is PONR. 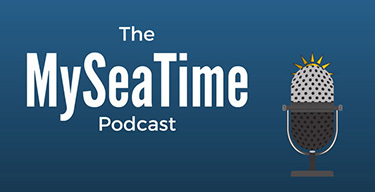 There is a far bigger Issue for today's mariners who are getting too bogged down with calculations, numbers , theoretical discussions, acronyms, terminology etc. that they are losing touch with bigger picture ( No fault of theirs, its the industry ) which can only be summarized by phrases ' Good seamanship practice' and 'situational awareness '.